Supply and Delivery of Twenty (20 No.) Mobile Laboratory, Gravel Road Test Kits - IRCP. A complete set of bidding documents may be purchased by interested bidders upon payment of a non-refundable fee of ZMW 1,000 or a bank certified cheque. 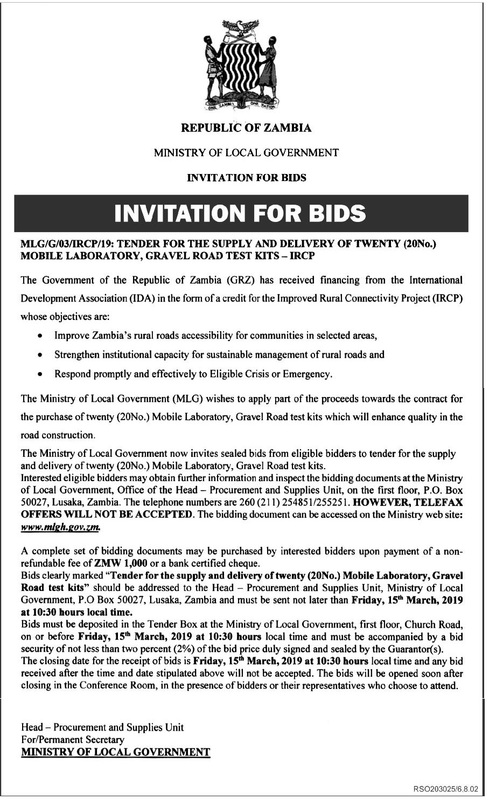 Bids must be deposited in the Tender Box at the Ministry of Local Government, first floor, Church Road, on or before Friday, 15,h March, 2019 at 10:30 hours local time and must be accompanied by a bid security of not less than two percent (2%) of the bid price duly signed and sealed by the Guarantors). The closing date for the receipt of bids is Friday, 15tt March, 2019 at 10:30 hours local time and any bid received after the time and date stipulated above will not be accepted. The bids will be opened soon after closing in the Conference Room, in the presence of bidders or their representatives who choose to attend.